This shows the name of the Application, Document, Directory and filename. If more than one window is open, the window that we are working with (Active Window) has a color or intensity different from the other title bar. The Quick Launch toolbar, which lets you start programs with one click. The middle section, which shows you which programs and documents you have open and allows you to quickly switch between them. The notification area, which includes a clock and icons (small pictures) that communicate the status of certain programs and computer settings. Like everything else in Windows XP, you can customize the taskbar to your liking. To do so, right-click the Start button and choose Properties. In the Taskbar and Start Menu Properties dialog box that opens, click on the Taskbar tab. As shown below. Lock the taskbar: If selected, hides all sizing handles on the taskbar so you can't accidentally move or resize it (as discussed below). Auto-hide the taskbar: If you select this option, the taskbar will be hidden most of the time so as to not take up any space on the screen. To make it visible, move the mouse pointer to the very bottom of your screen. Keep the taskbar on top of other windows: If selected, makes sure the taskbar is visible at all times, even when large maximized program windows are covering the rest of the screen. Group similar taskbar buttons: If selected, allows multiple taskbar buttons to collapse into a single button so the buttons don't become too small to see on the taskbar. Show Quick Launch: If selected, displayed the optional Quick Launch toolbar to the right of the Start button. You'll find articles on the Quick Launch toolbar and Notification area after you finish this article and click Back to return to the precious page. Windows XP is very flexible. You can size, color, and position anything to your liking. But you can only move and size things on the taskbar when the taskbar is unlocked. 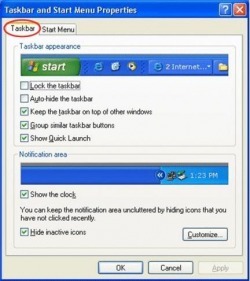 In addition to the option shown back in Figure 3, you can quickly lock, or unlock the taskbar at any time by right-clicking the current time in the lower right corner of your screen and choosing Lock the Taskbar from the shortcut menu that appears. You can tell when the taskbar is unlocked, because sizing handles are invisible, and Lock the Taskbar on the shortcut menu isn't checked, as in Figure 4. When the taskbar is locked, the sizing handles aren't visible, and the Lock the Taskbar option on the shortcut menu is selected (checked), as in Figure 5. Move the mouse pointer to the thin bar that appears along the top strip of the taskbar, until the mouse pointer turns to a two-headed arrow. Hold down the left mouse button and drag that top edge up or down until the taskbar is the width you want, then release the mouse button.